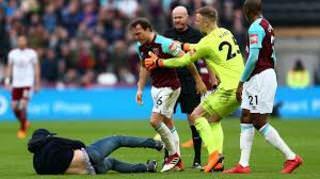 The Football Association said it would be seeking observations from West Ham as well as awaiting the match referee Lee Mason's report before considering what action to take, but with The Premier League joining in the condemnation of events it will only be a matter of time before 'firm action' is taken by the FA. The possible sanctions range from a hefty fine through to forcing West Ham to play at least one match at home behind closed doors, that would be the Southampton game due to be played on March the 31st, further sanctions could include a 'suspended' points deduction in order to try to ensure there are no repeats of Saturday's unpleasant scenes. The threat of further sanctions will remain against West Ham until the season's end, with one FA 'insider' saying that Hammers' were going to get a 'good kicking' for consistently breaching it's match day guide lines, the Premier League in conjunction with the FA have 'representatives' at every Premier League fixture, they are the ones with the puffer jackets emblazoned with a lions head that makes them look like generic Hull City supporters! For quite some time there has been a bit of an agenda regarding West Ham and the London Stadium, whether it be Mayor Sadiq Khan or a Tory back bencher looking for publicity banging on about the cost to the tax payer for the White Elephant Stadium, either way the public has been led to believe that West Ham United got a 'special deal'. It is now obvious that moving from the Boleyn Ground was not the groundbreaking (excuse the pun) exercise it was supposed to be, in fact it has had such a negative effect on the club that Hammers' should be paid for taking on such a monstrosity in order to spare the government's blushes. All the resentment that has been simmering has finally been let out the bag, and if fans think that this is the last of it then they will be very disappointed, this is going to run and run. Everyone and everything that is negative will be heaped upon the club, queues will form of axe grinders and don't be surprised if Sheffield United take action to ensure that they alone can hold the mantle of destroying a club efficiently! 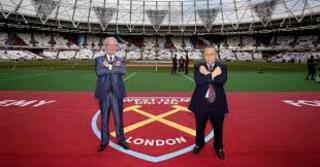 The London Stadium move was supposed to be the beginning of something great, not a protracted witch hunt, it was supposed to put West Ham United firmly in the spot light and raise the club's profile. Well it's certainly done that, but not in the way it was meant to, when you put yourself on a pedestal be prepared for some one to try and come and knock you off! Hard to disagree with that Burkie. Agreed burkie 1 ,60 years a supporter i am fed up to the back teeth with it all,its all been lies lies and damn lies all the time. If it wasn't so bleak it would have been comical. A very discreet way of telling fans to protest. O/T I think Carragher just may have lost his sky job,the dirty scumbag. lol, its not what it looks like….he was just asking for the way out. lol,yeah how do you get a way out of a job. I could never get my head round him getting such a high profile job on sky & this proves it!! i for one hope he is sacked as i am fed up having to put subtitles on whenever he speaks! biggest crime here is i just heard he gets paid over a million quid a year working for sky! wtf are we doing paying people that much to spout garbage on the t.v…. I am not a supporter of the unholy trinity, they came to our rescue when no one else cared and after that I have little respect. I said at the time a move to the LS was right, I still believe a big white elephant in our borough would be a disgrace for the country but mainly the good folk of Newham. The problem I feel is more incompetence than shear ignorance. They had a dream and they sold us their dream. Its now a nightmare. The job is just too big for them. They need to sell asap for their sake and the the good of the club. I heard that they plan to erect barriers to stop the fans getting to them, as said before, they leave large posh secure houses, get into chauffeur driven Rollers, front door of stadium, never see grass root fans, live in a 5 star world ... my God, will they say "let them eat cake" next! The incompetence of the LS ownership was magnified on Saturday at a level never seen before, stewarding was amateur at best. Fights were breaking out all around and these guys didn't have a clue. We had a "heated discussion" with a group (not season ticket holders) that thought the first idiot on the pitch was some sort of hero, two stewards turned up in our row and were quickly told to go away through self police by others... and in a decent society thats what happens, the good speak up! So, where do we go from here? Just give up? Certainly not. Peaceful protest? I was not in favour of the march but after Saturday some protest is an necessity! Yes! Get behind our team... definitely... COYI's!!!! Wont get any stick from me dartford!! Arsene Wenger is preparing a bid. its an owner/manager role. he fancies being the boss and his boss too. 1) Those clowns out immediately. 2) Give Moyes a real contract... desperate for stability! 3) Purchase of the LS for a pound... Khan etal will be pleased to be shot of it! 5) Set up a fans forum and LISTEN to them!!!! Its not rocket science! COYI's!!!!! Dartford, I think the buying the stadium for a quid is what the owners are waiting for now. As soon as they get that their profit on the club will go thro the roof and then they will sell asap. That's what they wanted from day 1 IMO. Sully will still haggle over a quid,and lose out. he'll insist on an instalment deal….1 pound over 10 years…..
Wenger will agree to buy. I think you are right Red Neck! The stewarding done on the cheap? You can't get cheaper than nothing! They don't actually pay for it! Those who say stay away will hit them in the pocket probably won't make a difference. Buying the stadium for a quid and more importantly the TV money makes the fans money seem like petty cash. I doubt that bothers them. Im surprised and disappointed in Moyes with this. I thought he was the old school, 'not good enough = extra work on the training pitch' sort. Sack him and the players.